Is the market finally running out of buyers? The market’s character is changing slightly as we saw the biggest intraday selloff in a month. Today was an outside reversal, meaning the high was higher and low was lower than the prior day. 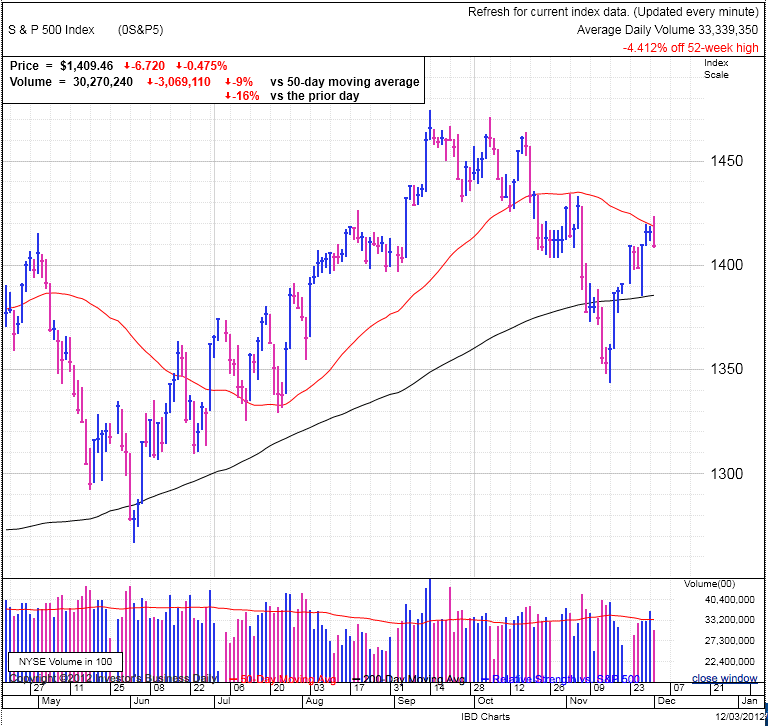 The market opened above the 50dma, but those were the highest levels of the day and the market sold off through the close. There were a few failed rally attempts, but each only temporarily halted the selling. This breaks the pattern of intraday bounce backs after early selloffs. We will see if tomorrow can find support, or if this too-far, too-fast rally has finally reached the breaking point. It will be interesting to see how Tuesday trades. Today’s price action was fairly negative and that could cause many would-be buyers to take a wait and see attitude. Few are going to buy tomorrow if they think they can get a better price in a few days. Without a demand from a pool of buyers, prices will fall to the point where buyers are finally tempted to come back. After today’s selloff, the ball is in the value investor’s court. We will fall until they see prices they can’t resist. We could see them stepping in tomorrow if they expect an imminent resolution to the Fiscal Cliff, or they could wait for us to bounce off the 200dma. They could even wait for us to penetrate the 200dma before stepping in in meaningful numbers. And lets not forget most of the bears were chased out of the market the last couple weeks and they are ready to pile on any weakness, further pressuring a weak market. There is no such thing as a safe trade in the stock market, but there are situations more favorable than others. It is these high probability trades that give the savvy trader an edge over the long-term. It looks like we are on the verge of one of those opportunities. No doubt this could turn into another short-squeeze, but I think the market has risen far enough to flush out the vast majority of shorts, meaning there is not a lot of shorts left to squeeze. We’ve also consumed most of the demand from buyers willing to chase this rally higher. There are no guarantees here, but it seems like the odds favor a pullback to at least the 200dma. Of course this is for the more nimble swing trader. Anyone with a longer view of the market should continue holding. Just be aware of the imminent pullback and prepare mentally for some near-term weakness. As most people cognitively recognize, we’ll resolve the Fiscal Cliff at some point, but the market could get emotional as the negotiations get ugly. AAPL’s daily price action mirrored the indexes day-long slide, but it finished in the green by a fraction of a percent, outperforming the broad market’s half-percent decline. There is a lot of talk of people selling their big winners ahead of an imminent tax policy change, but never ever let taxes influence your trading decisions. The market moves way too much for any tax savings to be worthwhile because they can be wiped out in a matter of days. Long-term capital gains, short-term capital gains, dividends at ordinary income rates, wash sale rules, etc, it doesn’t matter, trade the stock market. If you thought AAPL had a good run over the last 10 months, but chose to hold for two more just to get long-term capital gains treatment, how did that work out for you? Anyway, all the people who are listening to their accountant and selling gains this year are creating weakness in good stocks. Their loss can be your gain. And of course all these recently liquidated trading profits (and special dividends) are going to need a home next year. That buying could put prices higher in the first half of next year. Remember, only supply and demand directly determines prices, not fundamentals. If all these traders are buying back into the market after their tax sales, it will support the market no matter what else is going on in the world.